10 Tax Efficiency Tips You Should Know | Pure Financial Advisors, Inc. In case you missed it, we have a brand-new Federal income tax law which commenced on January 1, 2018, called the “Tax Cuts and Jobs Act of 2017“. If you’re trying to figure out how to minimize your tax liability given this new tax law, you’re not alone. To give you a head start, here are 10 tax efficiency strategies to pay less in taxes; fully updated for the new tax law. If your employer offers a 401(k) or 403(b) retirement savings plan, you can contribute $18,500 pre-tax, annually in 2018. If you’re 50 and older, you can add an additional $6,000, for a total annual pre-tax contribution limit of $24,500. Your employer may offer a match, which will effectively add more dollars to your plan. You should at least contribute up to your employer’s match. If that’s all you can handle currently, then simply add an additional 1% to 3% of your pay each year as you receive raises. A good goal would be to save at least 15% to 20% of your gross income into the plan. Remember that as you increase your plan contributions, your income tax withholding will be reduced because you’re paying taxes on a lower amount. You may also benefit from utilizing the Roth option within your retirement plan if offered. Remember, starting young is the always the best strategy for saving but even if you’re in your 60s, you can still improve your retirement lifestyle by saving today. Don’t procrastinate! A Roth IRA is truly one of the greatest gifts that the IRS has given us in the last couple of decades. You can contribute $5,500 per year to a Roth IRA in 2018, or $6,500 if you’re 50 and older, subject to your earned income (salaries & self-employment income). But even if you don’t have any earned income, you can utilize your spouses earned income to contribute to a Roth IRA. Although you don’t receive a current tax deduction, your principal, growth and income are 100% tax-free upon withdrawal in retirement; provided you are at least 59½ and have owned a Roth IRA for at least five years. If you’re phased out of making Roth contributions because your income is too high, the back-door Roth or the Roth Two-Step strategy still allows you to still contribute money to a Roth IRA. With this method, you contribute $5,500 in 2018 into a traditional IRA which is available to anyone with earned income under the age of 70½. You will likely not receive a tax deduction because your income is too high. You then convert the $5,500 in your traditional IRA to a Roth IRA, and you don’t pay any income taxes on it. Why? Because you never got a tax deduction in the first place. However, there is one big caveat to this strategy. If you already have existing IRAs (including traditional IRAs, SEPs and SIMPLE IRAs) you’ll fall under the pro-rata rule. This rule combines all of your IRAs into a single IRA and forces you to convert taxable amounts as well as non-taxable amounts to the Roth. Suffice to say, if you have existing IRAs, consult with your tax advisor to see if this is a viable strategy. In addition, some tax advisors believe there should be a “wait” period between your original IRA contribution and subsequent Roth conversion. In retirement, your biggest expenses are likely housing and medical costs. But guess what? Taxes may be a close third. 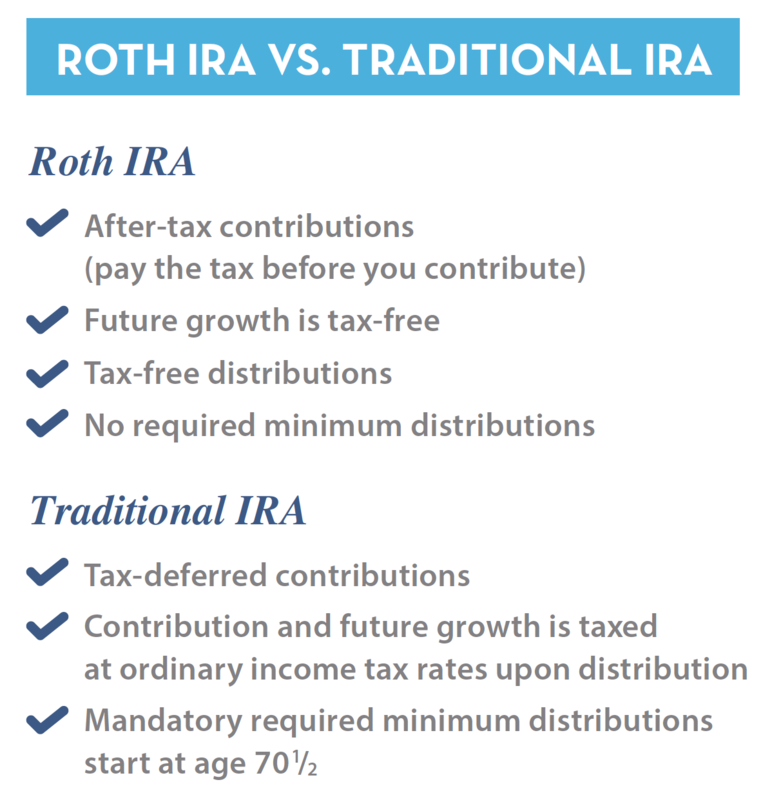 You may add money to a Roth IRA by converting from your existing IRAs or 401(k)s and the investments in that Roth account will grow tax-free. So, let’s just say you convert $50,000 one year from your traditional IRA to Roth IRA. Yes, you’ll pay tax on $50,000 and I understand that will not be fun. But if you’re in a low enough tax bracket, it might be a great strategy for you. Let’s say you’re 50 years old and you’re not planning to touch that $50,000 for 20 years. Maybe that $50,000 has grown to $100,000 or $200,000 (of course there are no guarantees that your investments will grow). But when it’s time to begin withdrawing funds in retirement, all of the principal, income and growth will be 100% tax-free. You only paid tax on $50,000, but you could receive $100,000 or $200,000 or whatever it has grown to without paying any additional tax. And guess what, your spouse or kids will inherit the Roth IRA and it will be tax-free to them as well. That’s a pretty good deal! It’s important to realize that you can no longer recharacterize Roth conversions, and this is brand new for 2018. In other words, you can no longer change your mind and undo your Roth conversion. Be very careful what you convert, because it can no longer be undone. Believe it or not, there are no restrictions on who can do a Roth conversion. It doesn’t matter how old you are, as long as you have money in an IRA or 401(k). You can be 15 years old or 85 years old, working or not working, and any amount can be converted. The best plan will be to look at your income tax brackets to see what level of conversion (if any) makes sense for you. Consult with your tax advisor on this one. Tax loss harvesting can be another important tax efficient investing strategy to save significantly on your tax bill. Let’s say you own a mutual fund in a brokerage account, outside of your retirement account. Of course, we always want our investments to go up in value, but that doesn’t always happen. Sometimes they go up, and then sometimes they crater. Markets do correct. If the mutual fund you’ve purchased goes down in value, then consider selling it. The difference between what you paid for it and what you sell it for is recorded on your tax return as a capital loss. That loss nets against other capital gains, dollar for dollar. So that’s a good thing – but you’re not done yet. When you sell the mutual fund (remember the one that went down in value), it’s a good idea to buy something very similar, so that you’re still invested in the market. You’ll be able to participate in any future market recovery1. Remember that the “wash-sale” rules prevent you from buying the exact same investment for 30 days. Bunching charitable donations is not a new concept, but it’s more important than ever because the standard deduction amounts are higher now under this new tax law. The standard deduction is $12,000 in 2018 for single people and $24,000 for married couples. This means that many of us will no longer be able to itemize. Many will simply not have enough deductions to get over those limits. This is particularly true when you consider that under the new tax law, you can only deduct $10,000 for state income and property taxes. If you’re married, have paid off your mortgage and you’re giving $10,000 annually to charity, you may never receive a tax benefit from making charitable donations. This is because the standard deduction could be greater than your itemized deductions. So here a strategy might be to give, say, $30,000 in one year, then nothing for the next two years. That way you’ll at least get a tax deduction for part of your charitable donations. Unfortunately, when you do that, your charities may be forever knocking on your door, because they saw a sizable donation. Number seven is how you can avoid that potential issue. You can set up a special kind of account called a donor-advised fund. Typically, this can be established at an investment custodian (i.e. think T.D. Ameritrade, Schwab, Fidelity and others). You contribute that $30,000 we just talked about into the account this year, and you receive a tax deduction on the full amount (in that tax year). The donation is invested according to your preferences and any growth or income will be tax-free. At your discretion, you grant that money to the charities of your choice as you see fit. This is a great way to make charitable donations and still receive the tax deduction, even with the higher standard deduction. It’s also a great strategy if you are having a big income year and you’re charitably inclined as the deduction will occur while you’re in higher tax brackets. When you contribute cash to a donor-advised fund or directly to charity, that’s great for the non-profit, and it’s a tax deduction for you. But by donating appreciated stock instead of cash creates a better benefit for you. Whatever the stock is worth on the date that you contribute it to charity is your tax deduction, and you don’t pay any tax on the gain – a double benefit! And guess what? Charities love receiving donations of appreciated stock because when they sell it, they don’t pay any tax on it either because they’re a non-profit. Section 199A is new in 2018; it allows a special 20% deduction for certain small businesses (pass-through entities including sole-proprietorships, partnerships, LLCs and S Corps). Perhaps you can change your employment status to an independent contractor to take advantage of this new benefit. For example, if you make $100,000 profit as an independent contractor, you may be entitled to a $20,000 tax deduction. Accordingly, you only pay tax on $80,000 as 20% of your net income may be tax-free. That 20% deduction doesn’t apply to income received as a salary. Now, there are all kinds of limitations, so be careful about this one and research it thoroughly before quitting your day job. But, doing your homework and careful planning can allow you to maximize this strategy, if you’re eligible. By the way, if you already have a small business, this one could really save you a lot of income taxes. The 30% tax credit for installing solar power is still in play through 2019.3 It was set to expire but got extended with recent tax legislation. This credit is available if you install solar panels on your residence for the purpose of residential electricity. For example, let’s say you invest $30,000 dollars for solar panels, your tax credit is 30% of $30,000 or $9,000. Remember that a tax credit (which directly reduces your income tax) is much more valuable than a tax deduction (which simply reduces your taxable income). With a $9,000 tax credit, if your tax bill would have been $9,000 from other income, you’ll pay zero in tax! Taking advantage of employer-sponsored retirement accounts and getting money into Roth IRAs, whether by direct contribution, backdoor Roth IRA contributions, or by Roth conversions are some very effective ways to reduce your future tax liabilities. Carefully planning your charitable giving by bunching your donations into a single year, using a donor-advised fund, or giving stock that’s appreciated in value are excellent ways to support your favorite non-profits and still receive the tax benefits of making charitable donations. Tax loss harvesting allows you to create tax deductions that are valuable against other capital gains. The new Section 199A deduction of 20% for small business provides many opportunities for tax planning. And now is the time to consider solar panels, while a 30% tax credit is still available. It’s all about keeping more of what you make and these strategies can help you to achieve that goal. For more information or a free personalized tax reduction analysis to minimize your current and future income taxes, contact us at Pure Financial. 1 – Market recoveries cannot be predicted and are not guaranteed. 2 – In addition, $3,000 of capital losses can be deducted against ordinary income each year. 3 – The credit actually is available through 2021, however, the percentage benefits are reduced starting in 2020.